Leadership is an important role that often, in a particular way of view is perceived as a male role. Leadership is also an important role in the life of God's people. For His people, God always gives leaders. One of the leaders given in the period before monarchy was šopeṭ. The šopeṭ described in the Book of Judges are mostly male, only one woman is told to have šopeṭ role, she is Deborah. Deborah's role as šopeṭ in the Book of Judges raises many pros and cons, especially with the presence of Barak. 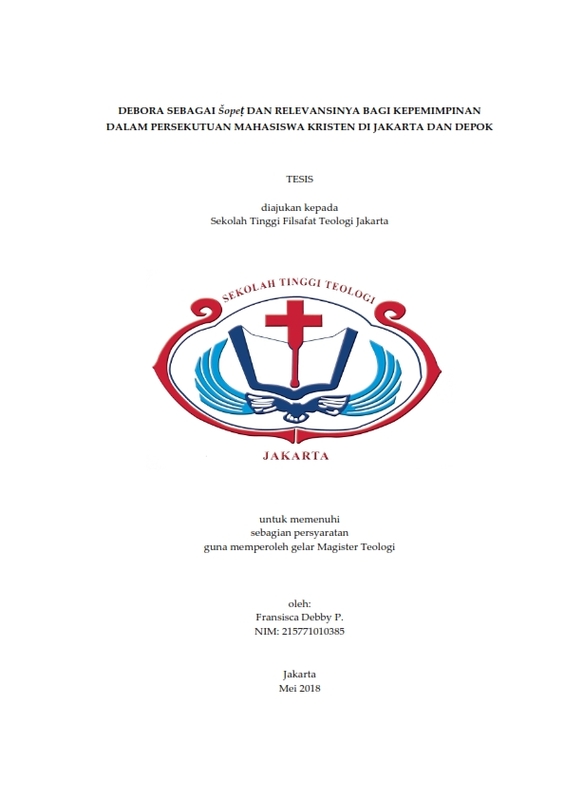 This thesis wants to prove that Debora is šopeṭ and her story is relevant to the leadership within the scope of Christian student fellowship in Jakarta and Depok. Through the discussion of the meaning of the word šopeṭ and also the narrative analysis with the feminist perspective on the Deborah story, Debora's role as šopeṭ is something that should not be denied. Deborah as šopeṭ means she is a leader and her existence as a leader is relevant to the leadership within the scope of Christian student fellowship in Jakarta and Depok. Now go, write it before them in a table, and note it in a book.